The Cuban economy is experiencing severe difficulties of a longstanding nature characterized by falling consumption, low labor productivity, insufficient investment and vulnerability to external shocks. Critically the government also suffers from a deep fiscal imbalance that impedes sustained growth and maintaining social programs for the population. To address some of these concerns but without altering the hegemony of central planning, the Cuban government is gradually implementing policy changes that will impact on the country’s employment, production and fiscal balance, and tangentially on the financial and credit systems. These measures are evidently a work in progress seemingly implemented on a cautious and piecemeal basis, possibly reflecting indecision at the highest levels of power and the fear of unintended social and political consequences. The new measures involve some liberalization of labor and product market regulations and new tax laws and are tentative steps in a greater role for private economic activity as outlined on November 1st 2010 in a document to guide the Congress of the Communist Party in April 2011.2 These measures were confirmed without major changes by the Congress. A key component of the new measures is the announced intention to shift half a million workers or roughly 10% of the labor force from state to private employment. While this announced policy implies a shift in the Cuban labor market, its impact will depend on the extent of its implementation and the degree to which workers obtain productive jobs, the flexibility of new regulations and controls and on needed overhaul of the financial system to enable effective financing of the newly established private firms. The object of the paper is to present an analysis of the new employment, tax and credit measures and their potential impact on GDP and on the fiscal accounts. A range of estimates are made for the impact on production and income, tax receipts and government outlays. Initial implementation has been quite slow, especially regarding the reduction in state employment at government offices and enterprises. Because of the severe price, production and consumption distortions and segmentation in the Cuban economy, the potential gains to individuals and the economy from earnest economic liberalization are large. Nonetheless, as it is evident from the multiple constrains, prohibitions, regulations and high taxes involved in the new measures, the authorities are striving to maintain tight control over the liberalization process. These controls will dampen or even fully contain the output and consumption gains from market opening. An assessment of the dynamics between political control and economic liberalization is beyond the scope of this paper and could shed light on why economic liberalization is constrained within a narrow operating space. Not surprisingly the Cuban authorities have identified bloated government agencies and state companies as a major element in the fiscal imbalance. To address this problem, the government is embarking on a reduction-in-force program dictated by sharp cuts in the 2011 budget and implemented by an array of mechanisms starting at the top of government agencies and state companies and followed down to the operational level. A mechanism has been outlined in September 2010 in decree-laws and its accompanying regulations to identify “trabajadores disponibles,” available workers that are found to be redundant and shifted to private activity in their own micro-firms or as employees of other such single proprietorships. Though an improvement from previous regulations, the new framework for the micro-firms still encompasses strong operating restrictions beyond the fact that only a small proportion of products and services are authorized to operate in the new markets. These restrictions will constrain private employment. Among the restrictions is a requirement that all operations take place in pesos (CUP), thereby banning transactions in convertible pesos (CUT) and foreign currencies, the banning of wholesale activities, interprovincial trades and most intermediation among firms. Parallel restrictions apply to rental activities which do no not allow rentals to foreigners or subletting. Restrictions are enforced by an array of fines and/or other penalties enforced through the courts. In May 2011 an easing of some restrictions were announced, for example, the allowance to hire nonfamily employees in all approved activities, the expansion of restaurants to 50 tables from 20, the legalization of car and real estate sales and an expansion of private cooperatives beyond farming. New tax legislation accompanies the self-employment regulations. Four types of tax will be imposed on the new firms: personal income tax, sales tax, payroll tax and social security tax. The new taxes aim primarily at improving state finances, though high rates and complicated monthly payment requirements could result in even larger evasion than is usual in developing countries by single proprietorships and the self-employed. Stringent taxes will also result in many activities taking place wholly or partially underground, limiting tax revenue and fostering operation of undersized and inefficient activities. This is on top of the clear aim of the new taxes to limit the size and scope of private employment activities and the new micro-firms. The personal income tax is based on annual net income of self-employed individuals and is levied on a progressive scale ranging from 0 to 50%. The base of the tax will be income net of expenditures. Deductible expenditures will be limited by new regulations and do not include any allowance for capital depreciation. For example, restaurants (limited to 20 tables, up five tables from previous regulation and increased to 50 in May 2011) will be subject to maximum deductions equivalent to 40% of revenues. Transportation activities will likewise be subject to a 40% limit, while “cocheros” (horse car drivers) are subject to a limit of 20%.9 The new tax system, though an improvement on previous legislation which allowed only 10% deductions, still will discriminate against enterprises whose cost of inputs exceed 40%, which will lead to curtailment of activity, firm creation and widespread tax evasion.10 In fact in most economies the average firm’s input costs will exceed 40% of revenues. Income taxes will be paid monthly according to a minimum scale according to each activity. Table 1 shows the rate schedule for the personal income tax. Social security tax is levied at 25% of the tax base. The base ranges from CUP 350 per month to CUP 2000 per month. The law establishes some mandatory levels for minimum monthly payments but allows individuals the selection of the level of base at which the person wishes to participate in the scheme. Pensions will be based on the level of contribution. It is not clear whether or not in practice there will be flexibility in selecting contribution levels. 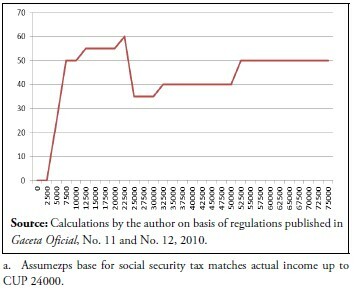 The figures below show the combined incidence of the personal income and social security taxes assuming that contributions of social security are calculated on actual annual net income matching base income up to CUP 24000. Figure 1 depicts the average tax incidence of both taxes. It shows that average taxation rises steeply at low levels of income, in fact reaching 50% at a CUP 5000 or about $208 annual income, and remain in a range of 50% to 60% with a step pattern arising from discrete changes in the personal rate schedule. 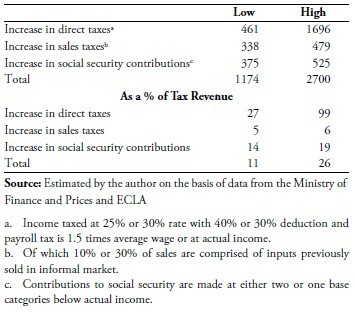 Inasmuch as individuals are able to make social security contributions at a fraction of their actual net income, they will be able to lower the tax incidence by as much as 10% to 20%, depending on actual implementation of the scheme. Figure 2 shows marginal tax rates for the combined personal income and social security taxes. 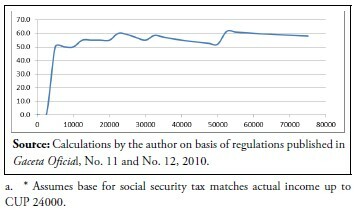 Because of the ceiling on social security contributions of CUP 24000, the combined tax is regressive in the middle range but becomes progressive as income reaches the top personal income tax level of 50%. The drop in marginal rates between CUP 24000 and CUP 30000 takes place as social security tax incidence ends. Sales of all products are taxed at 10%. The only exceptions are sales of farm products at retail outlets, which are taxed at a rate of 5%. Public services are also taxed at a 10% rate on the basis of the total value of services provided. A new 25% payroll tax is instituted. The base of the tax is the overall wage bill except that there is a minimum taxable amount equal to a multiple of the average wage for specific workers calculated by the appropriate local labor office. The base is made progressive as the minimum taxable amount increases with the size of the payroll. Thus for firms with 1 to 9 workers, the minimum equals 1.5 times, rising to 2 times for those between 10 and 15 workers and to 3 times for those firms that have more than 15 employees (Figure 3). 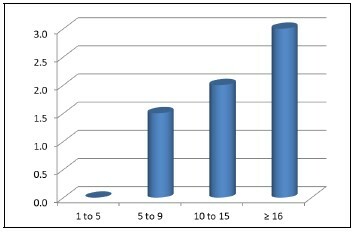 Figure 4, elaborated from data from the above authors and more recent data from the Ministry of Labor and Social Security, tells the story of the inconsistent approach towards labor market liberalization followed by the authorities in the last fifteen years. Periods of partial liberalization are followed by narrower interpretation of existing regulations and a decline in self-employment. In any case, at no time before 2011 did self-employment exceed 170,000 or only about 3.5% of the labor force. This of course does not take into account grey and black market activity and some farming by individuals which is reportedly a source of part-time employment and income for tens of thousands.13 Easing of restrictions on labor and product markets jointly with credit support may channel informal activity onto legal firms with the potential to operate at a higher scale and efficiency. At the present time, the authorities are moving in the direction of greater private employment, but are apparently constrained by considerations of institutional and political development and control. Departing from a low base, the expansion in self-employment in the first half of 2011 is still well below the goals of the government and needs of the economy. Occupations allowed for self-employment are largely those that require little or no capital (animal caretaker, hair dresser, lock smith). A few others, such as room and space rentals and transportation services, imply greater use of property or equipment. Among the approved 178 occupations, no more than 20 appear to require physical or working capital that would be in excess of CUP 20000.14 It is evident that the current liberalization of restrictions to self-employment is designed to apply essentially to the creation of micro-firms that cannot envision any substantial growth and hence pose sharp restrains on the country’s growth possibilities. Even though theoretically companies with two dozen or more employees could be established within the announced regulations, expansion is still constrained by an onerous tax system. Having said the above, the question is posed again as to whether or not the new regulations seriously aim at developing entrepreneurship even in small scale or is the goal just short-term budget improvement? The guidelines and its tight regulations show that at present only a tentative approach to the development of private economic activity is under way. The new small firms will need to be capitalized and provided of means of acquiring equipment, tools, operating space and working capital for supplies, inventory and salaries. Many of the newly self-employed will be able to operate at a low level of production and sales with their existing resources in the form of skills, a home office or shop, and perhaps a few tools and supplies. Others will want to have access to credit and capital. There are four important sources of this capital: personal savings, the banking system, informal loans or investments and foreign transfers. Household sector statistics in Cuba are scant and available only at an aggregate level.16 Available data from the Oficina Nacional de Estadísticas shows that the savings rate of Cuban households from 2004 to 2009 averaged 2% of income (see Table 2). The data shows a negative savings rate for 2009 of -1.7% and a positive rate of 2.3% for 2008. This means that measurable personal savings are very low and not likely to provide an important source for the financing of new enterprises. It is likely that measured savings are understated because of activities in the informal economy and because there are some savings from foreign transfers to Cuban residents, a topic that will be addressed below. In addition, implicit savings may take place in the accumulation of consumption and capital goods by some households in lieu of monetary savings, and such savings-in-kind could be used as inventory or as tools and equipment for a new microenterprise. Cuban banks are allowed to take deposits and make loans to individuals, but most of the loans are made to state enterprises or cooperatives. A vibrant self-employment sector would be helped greatly by access to credit from the banking system. This would require financial reforms that would deepen and broaden the operations of banks and finance companies in Cuba. It would require building-up a credit system, with an important role for micro-credits by local branches of existing or newly established banks which develop appropriate credit expertise. The banking system would be used to intermediate between the savings of enterprises owned by the state or by individuals and the nascent micro-firm sector. The experience of a number of successful micro-credit organizations in Latin America and Asia would be very advantageous in setting up new credit facilities. In May 2011 the Council of Ministers announced an allocation of US$120 million for equipment and inputs used in food producing activities to be administered by the banking system. It is not clear what proportion of these new funds will be available to the self-employed. It appears that some of this funding will be used in acquiring imported tools and intermediate goods that could contribute to capitalize the new micro-firms run by the self-employed, though the greater part may be used by cooperatives. Informal credit markets exist in Cuba and operate with both a monetary dimension and with transactions in kind. There is scant information on the operation of these markets. Nonetheless it is clear that in the absence of formal mechanisms of credit they could well play a role supplying retailers and other newly established firms with some inventory, working tools and operating space. Foreign remittances and transfers to Cuban residents must be used for consumption according to current Cuban regulations. Thus remittances legally cannot be used to capitalize a new enterprise.17 In practice, these legal restrictions may be enforced in varying degrees and often not enforced at all because remittances are sent through informal channels. Moreover, remittances used for the purchase of inventory would be difficult to distinguish from consumption. The government with its concerns about controlling the over-expansion of firms will likely be vigilant in the case of some prominent enterprises. Clearly, existing legislation, including tax provisions, is an inhibiting factor in the capitalization of new firms. In this section I make rough calculations of the potential impact of private employment on overall economic output. These calculations aim at gauging the initial impact of an increase in self-employment on GDP. The calculations are based on the official national income accounts and employment data and rely on average productivity estimates measured in 2008 CUP. A key assumption of the calculations is that workers shifting from state employment to private employment have a range of relative productivities (measured at factor cost) to the state sector average and move to a higher productivity level in the private sector. The precise productivity levels are unknown and in the extreme and not too unlikely case, workers could be shifting from near zero productivity to levels well above the economy-wide average. I use average productivity numbers derived from official data that yield a broad range of potential outcomes. Initial gains on GDP are derived from three sources: gains in average productivity due to a shift from state employment to private employment, gains from initial capital investment in the new firm and gains from a shift of transactions from informal to formal markets. I do not make any attempt at modeling secondary effects of these initial gains through their impact on income and aggregate demand as well as on overall supply. Such calculations can hardly be undertaken with available information and data on the Cuban economy. Even more importantly, implementation of the new policy changes will be highly discretionary in terms of application of new laws and regulations and differential coverage of products and services and also in terms of varying speed of implementation in regions and towns throughout the country. This means that the calculations made here are not a forecast but just highly conditional estimates aiming at obtaining a plausible range of values. Table 3 shows estimates of the initial impact on GDP from shifting 250,000 workers to private employment measured in Cuban pesos of 2008. Low and high estimates are given based on differing assumptions. On the low estimate the initial impact on GDP would be 2.0% and 6.4% for the high estimate. These are not calendar year estimates but simply the first order estimate over the period necessary to make the initial investment and fully employ the 250,000 workers for 12–months which will correspond to an overall time period larger than one-year. The gains on average productivity are the first element in the calculation and derive from a sector shift from the low productivity state sector to a higher productivity private employment and from lower to higher individual productivity. Average output in the government services sector in 2008 was CUP 10,100 while average output in the economy was CUP 12,300. Likewise a range of assumptions in personal productivity from 80% to 120% of the average are used in the calculation. This gain in average output is an important source of potential gain from self-employment. The impact on initial capital investment is constrained by lack of equity capital and credit available to the new enterprises. At the outset, unless other policy changes are made that have not yet been disclosed, the new firms will have little access to credit from the Cuban banking and financial systems and while there may be savings available from domestic sources outside of the financial system, these are quite small. In the calculations foreign sources provide the only substantial source of equity and working capital. The simple assumption here is that growth of 10% or 15% in annual foreign remittances, now estimated at US$0.9 billion per year, will be used to capitalize the new firms.18 These result in a contribution to GDP of 1.4% and 2.1% of GDP. At present foreign remittances are allowed to be used only for consumption. Thus it is presumed that either this will change or that the authorities will not or cannot enforce existing regulations. Otherwise the impact on GDP will be appreciably reduced. 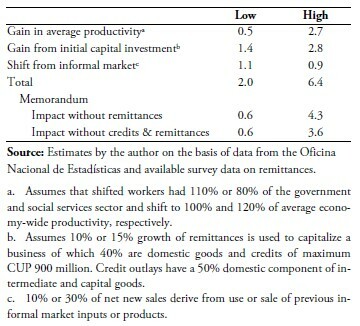 Additionally, in the high estimate it is assumed the selfemployed will receive some US$40 million in credits from Cuban banks which will contribute 0.7% of GDP in a first round impact.19 A critical assumption in these calculations is the domestic component of capital expenditures financed by remittance growth or by local credit. The domestic component ratio used is 40% for remittances and 50% for domestic credit. Figure 5 shows potential outcomes for GDP growth for values of the domestic component of investment financed by remittances. This exercise stresses the key importance of liberalization and flexibility in the application of regulations with respect to remittances and regarding their use. In the absence of such treatment, the low range of estimates may amount to around 0.6% of GDP, in the case where there is no use of remittances and no incentive to move some sales to formal channels. An alternative to remittances would be a wide liberalization of domestic bank credit as long as banks perform a true intermediation role between savers and investors. Cuba’s banking system does not now perform this role well, except as a mechanism to finance the state from surplus exporting enterprises and services activities. Fiscal concerns are at the heart of the new policies aiming at a massive reduction in the state’s payroll. Mesa-Lago points out to the government’s dilemma of choosing between ambitious fiscal goals and the need to generate productive employment. 21 According to data provided by ECLAC, the central government’s 2009 fiscal deficit was equivalent to 4.8% of GDP, down from 6.8% in the previous year during the low point of the international financial crisis.22 Though there are no publicly available figures for the balance of the consolidated public sector, it is thought that the shortfall in 2009 may exceed 8% of GDP, placing reliance on the central bank for financing and undermining monetary policy. The revenue impact of the new taxes levied on the self-employed is potentially substantial. Mesa-Lago reports that collections from 250,000 newly self-employed may reach CUP 1 billion by 2011.23 This figure apparently takes into account some degree of tax evasion. My calculations (below) do not take into account tax evasion and indicate that the tax receipts would be in the range of the 1 billion estimate for the low revenue case and that a much higher potential for receipts could come out in the presence of greater liberalization of activities and use of foreign transfers. Table 4 estimates the impact on tax receipts of shifting 250,000 workers to private employment. The estimates are calculated for direct taxes, comprising income and payroll taxes, and for sales taxes and social security contributions. These are estimates of taxes accrued under the newly announced tax regulations which are described in a previous section. It is not possible to predict the compliance rate, which tax experts deem to be relatively low for the self-employed. However, it is expected that the fiscal authorities will enforce the tax code with some vigor. Undoubtedly, the high tax rates on income and sales will act as an incentive to evasion and to a reversion of business to the underground economy. To the extent that many activities can not easily shift underground, sizable underreporting of revenues is to be anticipated. The estimate for accrued taxes from new private employment range between CUP 1.2 billion and CUP 2.7 billion. The bulk of the revenues would come from direct taxes (CUP 0.5 billion to CUP 1.7 billion). Sales tax receipts are not as important even as we assume that some tax is derived from transactions migrating out of the informal economy. Social security contributions are based on either the selection of a lower tax base or at actual income, and actual tax accrued will depend on guidelines issued for the application of the tax to the self-employed. These estimates hinge on the government’s ability to productively shift 250,000 employees out of the state sector. The experience as of May 2011 points out to at most some 50,000 workers shifted out of the state sector, so far a modest outcome. The new taxes represent an important increase in the tax base and potential receipts for direct taxes, which were practically non-existent in Cuba but a much less important revenue source from indirect taxes and social security. Overall, the new tax measures would represent accrued obligations equivalent to between 11% and 29% of current tax receipts. Even at an evasion rate of 50%, the new tax measures would raise receipts in a range of roughly 6% to 15% of overall revenue on the presumption that 250,000 new workers are fully employed in the private sector. Table 5 summarizes the fiscal impact of the new employment and tax measures calculated on an accrual basis. Tax revenue increases range between about 2% and 4.5% of GDP, while payroll cuts in the state sector could contribute an amount equal to between 1.5% and 3.5% of GDP. 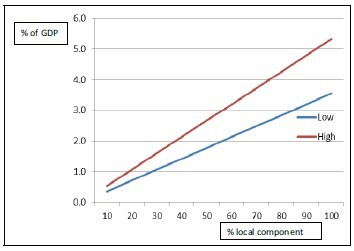 This reduction-in-force in the state sector would amount to 4.2% of GDP at 2008 average state salaries but the effective cut in outlays would be less because of various subsidies and programs provided to the newly unemployed.24 In total the net fiscal impact would range from about 3.5% to 8% of GDP. As these calculations are made in accrual terms, actual results on a cash basis would be much less substantial, particularly on the revenue side. Nonetheless given the delicate fiscal situation, the new measures can be instrumental in making the budget more manageable. This paper does not aim at the question of how many private jobs can be created by liberalization of regulations. The highly discretionary implementation of new rules and the micromanagement of liberalization measures implies an unpredictable process. Nonetheless a brief comment is in order to clarify the potential trade-off between fiscal and employment goals. It is clear that the high and very progressive rate of income and payroll taxes poses a formidable constrain on employment and ultimately on the overall expansion of formal private employment. It is not possible to ascertain the precise anti-employment impact of the new tax structure, but it is evident that lower rates and especially a low and simple payroll tax would significantly reduce constrains to employment creation. The new regulation eliminating the payroll tax in 2011 to establishments having up to five employees could be extended in time and applied to larger firms as well. A more rational and lower incidence tax structure could ease or even eliminate the trade-off between fiscal and employment goals. This would require that the government view vigorous small and medium size enterprises as desirable and consistent with overall economic and social goals, something that up to now is not apparent. Any economic policy decision in Cuba would need to take into account the perilous state of the country’s external accounts. It is surprising that the new employment and tax measures do not address this problem even indirectly. To start the government will keep near complete control of labor used by joint ventures and other foreign enterprises. Very few of the newly approved occupations will be directed at the export or tourist sector and far more could be done to encourage industries and services that would expand and support international trade and attract foreign capital and credits. While other measures regarding small farmers and cooperatives have many elements of import substitution, the shift of workers from the state sector is not involved primarily in goods production but in what may be called domestic services that yet could be used to reinforce Cuba’s competitive position in tourism and other activities. A more forceful opening of labor markets would help to attract foreign direct investment, but such steps are not now mentioned by the authorities. Direct contracting of workers by foreign or joint venture companies would go a long way to provide higher income jobs while allowing the government to raise revenue from personal and corporate taxation and there is as yet no sign that this is being contemplated. Constrains and taxes on the use of remittance proceeds could be eased even if equity ownership remains wholly in the hands of residents. Lifting residency requirements for equity participation would be positive, but it is difficult to envisage such a move at the present time. International credit from multilateral institutions and commercial banks from OECD countries is now limited to some short-term trade credit. A start would be to allow micro-credit agencies from abroad to operate in Cuba, bringing know how, technology and some capital. The new employment and tax policies aim at improving the fiscal balance rather than achieving deep reform of labor and product markets. As presently structured, the new regulations and taxes hinder rapid private employment growth. Because of very low labor productivity in the state sector, the new policies could be a substantial factor in reviving the economy as long as implementation is made in a flexible manner, initial capital financing is available from domestic and foreign sources and new labor and product markets are allowed to develop not unduly constrained by the micromanagement of liberalization. The use of price controls, size limits on firms, confiscatory taxation and petty regulatory activity are now part of such adverse micromanagement. Time will tell whether this limited opening towards private activity is a first step to a more substantial role for private entrepreneurship and investment or just a component of a temporary emergency package aimed primarily at stabilizing precarious government finances. As part of a fiscal package, the new employment and tax policies will be significant in lowering the fiscal deficit if 250,000 workers are successfully moved into full-time employment in the private sector. So far in mid-2011, estimates are that a fifth of that number has shifted to self-employment. The policies’ impact on production and income fall within a broad range, denoting both the potential and, more poignantly, the limitations of the present course of constrained liberalization. The authorities continue to face a dilemma between allowing a greater opening to private activity, employment and sound growth on one hand and on the other hand control or prevention of even modest personal wealth and capital accumulation that historically has been the government’s bête noire. 1. The paper benefitted from comments made by Roger Betancourt, but all remaining errors are the responsibility of the author. 2. Lineamientos de Política Económica y Social. La Habana, 11 November 2010. 3. Gaceta Oficial, No. 11, 1o de octubre de 2010. 4. See for example Pavel Vidal Alejandro, “Los cambios estructurales e institucionales,” Espacio Laical, No. 1, 2010. 5. ECLA, Economic Survey of Latin America and the Caribbean, 2009–2010. Cuba Economic Survey, Statistical Appendix. 7. Gaceta Oficial, No. 12, 30 de septiembre de 2010. 8. Granma, 29 de mayo de 2011. 9. As a result of the new tax it is reported that “cocheros” in Bayamo went on strike claiming the taxes when passed through to clients quashed demand, see “Los cocheros de Bayamo en huelga por una subida de impuestos,” Diario de Cuba, December 3, 2010. Subsequently in May 2011, the cocheros’ cost deductions were raised to 40% from 20%. 10. This point is well made by A.R.M. Ritter and J.A. Turvey in “The Tax regime for Micro-Enterprise in Cuba,” Manuscript, February, 2000. 11. Pavel Vidal and Omar Everleny Pérez Villanueva, “Entre el ajuste fiscal y los cambios estructurales: se extiende el cuentapropismo en Cuba,” Espacio Laical, 112 (Octubre 2010). 12. Granma, 29 de mayo de 2011. 13. Carmelo Mesa-Lago surveys the history of hidden unemployment in Cuba in “El desempleo en Cuba: de oculto a visible,” Espacio Laical, 4/2010. 14. This amounts to around US$800 or less at the informal exchange rate. Figure 4. 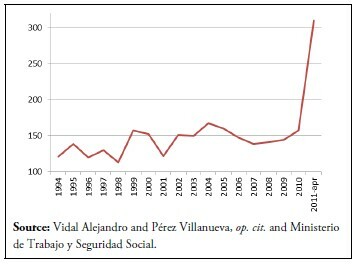 Self-Employment 1994–2011 (Thousands) Source: Vidal Alejandro and Pérez Villanueva, op. cit. and Ministerio de Trabajo y Seguridad Social. 15. This point is made in Mesa-Lago, op. cit. who recommends broader skill categories or a list of prohibited fields. 16. Oficina Nacional de Estadísticas, “Balance de ingresos y egresos monetarios de la poblacion,” Anuario estadístico de Cuba 2009. 17. Available survey data indicates the savings rate from remittances is very small, see M. González Corzo, “Cómo estimular el uso de las remesas mas allá del consumo en Cuba,” Enfoque Económico, ICCAS, Enero 2010. 18. I am ignoring consideration of taxes imposed by the Cuban government on formal remittances. In practice remittances are also made through informal channels. 20. Vidal Alejandro and Pérez Villanueva, op. cit. and Oficina Nacional de Estadísticas. 22. CEPAL, Estudio Económico de America Latina y el Caribe 2009–2010—Cuba: anexo estadístico. 24. An additional source of savings from the reduction-in-force is the amount of supplies and material that would not be pilfered or stolen from state companies and offices by which laid-off employees supplement their meager cash salaries.